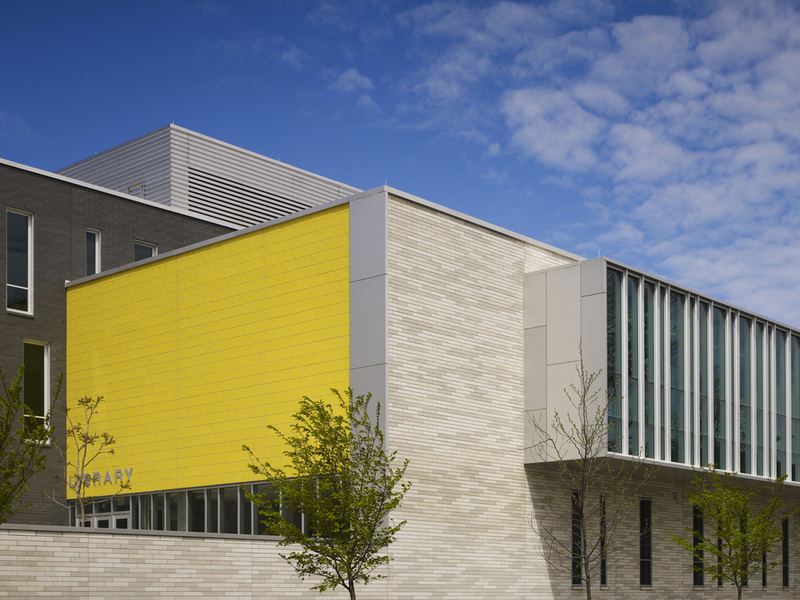 Chicago Illinois This public high school is organized into three thematic bars—body (athletics), mind (classrooms) and spirit (arts)—which slide against each other to create usable exterior spaces—entry courtyard, athletics fields, reading garden to make full use of its urban site. The design is compact and multi-functional: the library, pool and gymnasium to be entered separately to better serve its community when the school is out of session. Interior space planning stresses adaptability and flexibility, with multi-functioning spaces:the gymnasium converts to a 1200 seat auditorium, and multi-purpose spaces can be flexibly adapted to various needs (recitals, exhibitions, lectures, etc.). Built to last 100 years, the design conveys dignity and solidity. A continuous masonry ribbon snakes through the site to create the three zones. Dark on one side, light on the other, this thick masonry wall serves to differentiate the building massing based on the viewer’s perspective, and serves as a thermal mass to offset the building’s heating and cooling requirements.